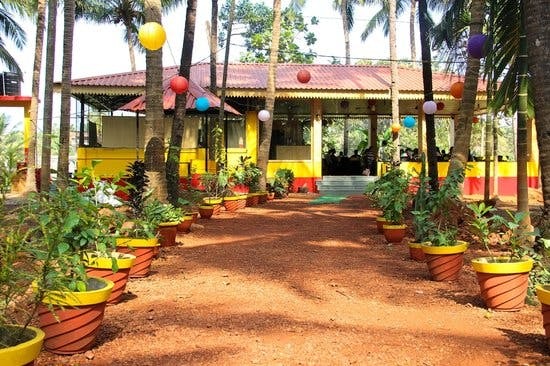 Edward’s Yard is a mini nature getaway, with unique assortment of interesting dishes including Goan delicacies and tandoori and Chinese cuisine offerings. What Should I Try Here? Popular with the locals for their extensive variety of seafood preparations, you can also branch out and try their tandoori and Chinese dishes. Well cooked and not too spicy, there is a certain homemade essence to all the dishes. Every corner of the property is a beautiful nook, with some rabbits and chickens giving it a farm vibe. Equidistant from North and South Goa, this restaurant is a hidden gem in Goa. With lakes and trees around, enjoy their expansive outdoor seating (there’s indoor seating too for any chilly night) and enjoy their reasonably priced food. Gets crowded by 9 pm, so plan accordingly. It’s also easy to miss the turn on the highway, so drive carefully.